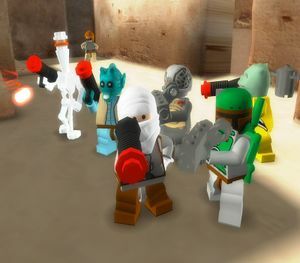 LEGO Star Wars II: The Original Trilogy is a video game based on the Star Wars themed toyline by the LEGO Group and the sequel to the video game LEGO Star Wars: The Video Game. It covers the events of the Original Star Wars Trilogy. The game was released on September 11, 2006 in Europe (although some shops, such as GAME, were selling copies as early as the 8th) and September 12, 2006 in the United States. This was the same day that the unaltered theatrical editions of the original trilogy were released on DVD. It was developed by Traveller's Tales and Amaze Entertainment and was simultaneously released for the PC, Xbox, Nintendo GameCube, PlayStation 2, Game Boy Advance, Nintendo DS, PlayStation Portable and Xbox 360. The game was published by LucasArts/TT Games in the US and by Activision in Europe. The Mac OS X version was published by Feral Interactive on 4 May 2007. The game is rated E10+ for Ages 10 and up by the ESRB for Cartoon Violence and Crude Humor, and 3+ by the PEGI. The hub for this game was Mos Eisley Cantina. Almost everything in the game is made out of LEGO bricks. Like its predecessor, this game presents a humorous view of the Star Wars universe, and re-tells some of the original trilogy's most famous moments through cut-scenes that feature no dialogue whatsoever. 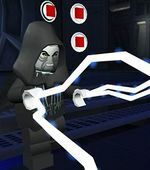 The ability to "create" new LEGO Star Wars characters is a new feature in the game, allowing the player to mix multiple character parts, which also automatically creates a name for the new character (such as a Master Leia, C, Boba Skywalker or Darth 3PO), or allows the player to name the creation (excluding the Nintendo DS version). 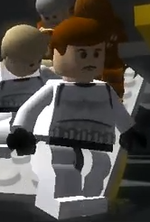 Using a saved game from the previous LEGO Star Wars games allows the player to transfer the prequel characters into the Original Trilogy, although prequel characters cannot be customized, save for a few select pieces. The difficulty adjusts to suit the player. This "adaptive difficulty" function is a feature that has been implemented by Traveller's Tales as a response to the relative ease in which gamers completed the first game. This feature can be manually turned on or off in the extras menu. Luke Skywalker duels with Emperor Palpatine during the penultimate level of the game, an event not in the original film, Return of the Jedi. Playable characters are from the Original Trilogy of the Star Wars saga (Episodes IV, V, and VI), including Han Solo, Luke Skywalker, Ben Kenobi, Yoda, Chewbacca, Boba Fett, Princess Leia, C-3PO, R2-D2, Darth Vader, and Emperor Palpatine. 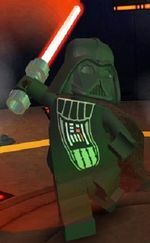 If a player has a saved game from LEGO Star Wars: The Video Game, then 46 of the characters from the last game will be available, excluding those unlocked in the bonus level (Darth Vader, Princess Leia, Stormtrooper, and Rebel Trooper) and C-3PO, R2-D2, Yoda, Chewbacca, Darth Sidious, and Gonk Droid, as they are characters that also appear in the Original Trilogy time frame, and must be unlocked conventionally. However, this ability must be purchased first. 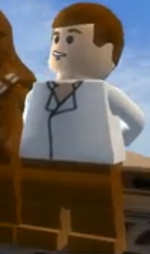 When a player unlocks a character from the standard game, they also unlock its LEGO Bricks which can be used to make custom characters. According to LucasArts, this adds up to 1,000,000 character combinations. During E3 2006, it was confirmed that 50 characters can be unlocked by playing through Story mode. The rest have to be purchased using studs, the game's currency. All of these characters can be used to create a custom character, which is made up of a combination of nine pieces (hat, head, body, cape, arms, hands, weapon, hip and legs). 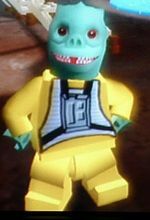 Some characters have a limited amount of pieces usable in Customization Mode, such as those with an irregular head (such as Yoda or Greedo). In those cases, the character cannot wear a hat or helmet. 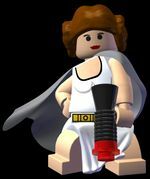 A cross between Darth Vader and Princess Leia (slave outfit), with a purple cloak and a Wookiee bowcaster: named as "Darth Leia" in the game. The last two characters in the character selection screen are custom characters that can be assembled in the Mos Eisley Cantina. 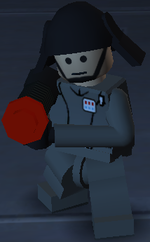 Although there is a large amount of pieces available for customizing a character, not every character's body, arms, weapon, head, or hat is usable; for example, there is no Darth Vader body or head—only his helmet; also, there are no axes, spears, dual blasters, double-bladed lightsabers, or blaster carbines, and players can't be unarmed. The cape option doesn't encompass backpacks, and as such, there are no rocket packs. A character's head or hat and what they have in their hand dictates their powers, with a few exceptions—using the Emperor's head will not give the character the ability of Force Lightning, for example. The Nintendo DS version of the game is the only version to deviate from these rules, featuring nearly all of every single character's pieces. Every weapon used by every character appearing is usable, including several completely original weapons such as a black and rainbow lightsaber. Jet packs, short legs, and other functional extras not included in the console versions also appear. There are weapons you can only get with cheat codes, like a ninja sword or a white lightsaber. 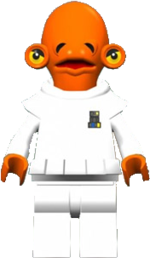 Extra Toggle simply means when one plays a level in Free Play mode, characters unobtainable by other means are playable (such as a Womp Rat and Han Solo in Carbonite). However Old Save characters, Extra Toggle characters, custom characters and vehicles are not available for playability in the cantina. 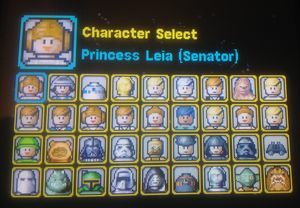 The Use Old Save feature is an extra which enables the player to import all of the characters from LEGO Star Wars: The Video Game (with the exception of Chewbacca, Gonk Droid, Stormtrooper, Darth Vader, Princess Leia, Rebel Trooper, R2-D2, C-3PO, the Emperor, and Yoda, since they appear in LEGO Star Wars II: The Original Trilogy) and use them in free play. In order to use this feature, the LEGO Star Wars save game must be present on the same memory card as is being used for LEGO Star Wars II. If using a PC, LEGO Star Wars must be installed in its default location, or else its save game folder must be copied into LEGO Star Wars II's save game folder for it to be found. 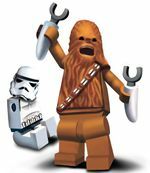 The many characters exclusive to LEGO Star Wars: The Video Game are added to the character select screen; however, due to changed abilities in the second game, some characters are changed with several - such as Jar Jar Binks - being rendered useless. Players can jump into vehicles and move about the levels with them. Unlike the original game, in which vehicles were on rails, vehicles are able to move freely wherever the player wants. This is considered by many to be the best improvement in the game. The player's health hearts are replaced with metallic hearts, representing the health of the vehicle. If the vehicle's health is depleted when not in a vehicle-only stage, the character driving it will lose studs and be ejected; however, no matter how much damage a vehicle sustains, it will survive. Once a mini-kit set is completed, the player can drive that vehicle and use it in the "Minikit Bonus" level unlocked after finishing an episode's story. Starships can collect Proton torpedoes, and Snowspeeders can be able to tow bombs to help the player complete the level. For example, the Millennium Falcon might shoot an asteroid and uncover a proton torpedo. If a large asteroid - large enough that the Millennium Falcon cannot destroy it with blasters - appears, the proton torpedo may be used to destroy it. In addition, some ships can carry more torpedoes than others, the usual limit being three, but the limit for the Y-wing and TIE Bomber being five. 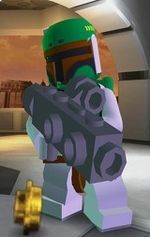 After a player collects all 180 minikit canisters (found in the game), they are granted Boba Fett's Slave I to use in free play. Just like in the first game where levels were accessed by entering doors in Dexter's Diner, levels in this game are accessed in the Mos Eisley Cantina. A large number of Star Wars locations are present, including Hoth, Bespin, Tatooine and the forest moon of Endor. After completing all chapters in an episode and collecting a certain number of gold bricks (8 for A New Hope, 16 for The Empire Strikes Back, 32 for Return of the Jedi), a secret entrance can be constructed in each episode's room (denoted by a question mark symbol) which contains three bonus levels. The first of these levels is Super Story mode, in which the player gets to replay the entire episode continuously. Added objectives that can be avoided are the records of obtaining 100,000 LEGO studs and completing all six levels within a cumulative time of one hour. Nevertheless, finishing the Super Story mode, with or without all objectives completed, gives the player one gold brick. 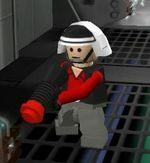 The other two levels consist of collecting 1,000,000 studs within a required time of five to seven minutes to gain a gold brick, as a character of the player's choice and as a minikit vehicle (if any minikit in the game has been completed, it can be used in any episode's bonus level; however, the more minikits are collected, the more options there are to use, and you are also able to play any collected minikit from the original game if you have a save file present.). Once all bounty hunter characters in the game (4-LOM, IG-88, Dengar, Bossk, Greedo and Boba Fett) have been unlocked, a special bounty hunter mode, consisting of ten levels, becomes available. A gold brick is obtained for completing each level. During bounty hunter mode, the player is given three minutes to find the bounty in the level he/she is playing in. The name of the level dictates the bounty. The bounty hunters 4-LOM and IG-88 can open R2-D2 and C-3PO doors, while all Bounty Hunters can open Bounty Hunter doors. Studs are earned via the time remaining once the level is completed, with more time remaining equaling more studs. 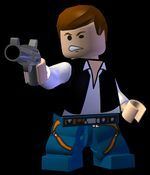 By achieving certain objectives throughout levels (completing the levels, collecting enough studs to fill the Jedi meter, finishing the mini-kits, as well as a few hidden objectives), the player earns gold bricks. Once 60 gold bricks have been collected and the player has completed story play in all three episodes, the player can enter LEGO City. This is a playground level set in a LEGO City (based on the LEGO Town series) where the objective is to collect all one million studs in the level. Once all 99 gold bricks have been collected, a stud fountain outside the cantina is unlocked; this spits out numerous silver, gold and blue studs every four seconds. The maximum score attainable is 4,000,000,000 - once this total has been reached the stud counter stops incrementing. On December 22 2006, two cheat codes were announced that allowed the player to create Santa as a playable character. For Comic Relief's Red Nose Day 2007 another special code was released, giving each character a red nose. For the Game Boy Advance, the game is altered for portability reasons, such as lower quality graphics. This version has 36 playable characters, which is fewer than the console versions, although it does feature characters not available in console versions such as a Baby Rancor, R2-Q5 and K-3PO. Also, Vader is unlocked at an earlier time, and the scout trooper and mouse droid are now playable without using the extra toggle mode. The generic Ewok is gone, and Wicket's slingshot is replaced with a spear. There are not any power bricks to find, but there are still extras to buy, which are better than the 128-bit console counterparts; for example, the Jedi Spirit extra turns characters into Force ghosts, something that can only be done when one of the three ghost characters in the 128-bit version is used. There are five levels in Episodes IV and V, and six levels in Episode VI. 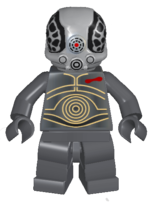 A character in each level is unlocked when all ten minikits are collected. The Dagobah level is not in the Game Boy version. Mos Eisley Spaceport and Through the Jundland Wastes are formed as one level (Tatooine). The console versions' levels "Jedi Destiny" (Emperor Fight) and "Into The Death Star" (Death Star 2 Battle) are reversed. For the Nintendo DS version, like the Game Boy Advance version, the game was altered for portability reasons, such as having lower quality graphics. The DS version has 50 characters, though they don't exactly match the ones from the console games. In addition to cooperative multiplayer, the DS version allows up to four people to battle wirelessly, where they can choose to fight over Han Solo (Carbonite) in Jabba's Palace or battle in a Tatooine-themed arena. Character swapping is performed by touching icons on the touch screen. Though generally praised for its gameplay, the original release of the DS version was criticized for its bugs and graphic glitches. Many Internet sites accused it of being rushed to shelves with the other versions of the game and the reissued Star Wars DVD films. One website was supposedly contacted by anonymous employees of the developer which claimed that the US, European, and Japanese versions were different from each other regarding the bugs, and that a new fixed version would be shipped to shelves after the first print run was sold out. One of the most notable glitches is in Episode VI, where many have considered the first main boss entirely unbeatable. This has not been verified by either the publisher or developer. 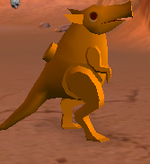 Characters such as Salacious Crumb, Bith Band members, and Wuher (who can, strangely, hover instead of jump) are available only in this version. Some levels are renamed. Just like the GBA version the levels "Mos Eisley Spaceport" and "Through the Jundland Wastes" are formed as one level, "Into the Death Star" and "Jedi Destiny" are both also renamed. The PlayStation Portable version of LEGO Star Wars II: The Original Trilogy contains exclusive material including the final levels from Episodes I, II and III of the first LEGO Star Wars game and a challenge mode for each level in LSW II, where the player goes through each level to find all 10 blue minikits in a time limit. 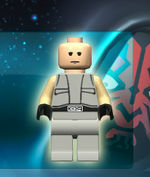 If completed, the player will achieve a character from the original LEGO Star Wars game. Like the DS version, it contains a Wireless Lobby. The cantina's area is made a ghost town featuring only the player and one other character, to make sure the game runs lag-free. The bounty hunter missions are excluded from the game in place of the prequel episodes' levels. Gold bricks cannot be bought from the cantina, and there are much longer loading times. There have been problems on numerous PC games that, when trying to install, an error message appears claiming that the Defaul~1.cab file is corrupt. This can be fixed by moving the disk's contents onto the hard drive, renaming the Defaul~1.cab to x.x, trying to install, when it says it can't find Defaul~1.cab, go back and rename the file to Defaul~1.cab. Then click retry. The game sold more than 1.1 million copies worldwide in its opening week. Variety's Ben Fritz called it "adorable", and said that it was "no wonder it sold more than a million copies in its first week on shelves". It was part of Gaming Target's "52 Games We'll Still Be Playing From 2006" selection, and was placed tenth in GameSpy's "Game of the Year" PC top ten. 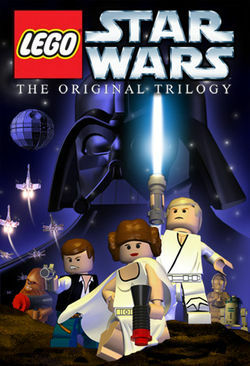 On December 22, 2006, StarWars.com declared LEGO Star Wars II: The Original Trilogy the best Star Wars related thing of 2006. IGN.com reviewer Jeremy Dunham said "it's a heck of a lot of fun and has a great amount of replay value beyond a single play-through. Best family game this year? Probably so." in his review, giving it a rating of "Impressive" with a score of 8.4/10. GameSpot reviewer Ryan Scott said "anyone with even a sliver of nostalgia for Star Wars will find this to be a fun, good-natured romp." and gave it a rating of "good" with a score of 7.7. GameSpy called it "a block-busting blast" and gave it four and a half stars, with a rating of "Great". IGN called it "One of the Most Anticipated Family Entertainment Titles of 2006" in their press release of the game. Reader's Digest named it as one of "5 Things We Don't Want You to Miss" in their September 2006 issue. Figures released by The NPD Group show the game as being the third highest selling of 2006 for all consoles, except for PC. Time magazine place in ninth on their list of the top ten video games of 2006. On Chapter 2, Episode IV Through the Jundland Wastes, at the very last part of the level outside of Obi-Wan Kenobi's house, if you take a landspeeder and drive it off the cliff, but jump out at the last second back where it's safe, then the landspeeder will just stay there and you can hop onto it. Get a character with a blaster and shoot it continuously and it will float farther and farther out of bounds. In free play, change to a character that is right in front of a droid in the toggle order. Hop into any kind of vehicle or something and ride off a cliff or into a pit. When your character pops back up in the air to give you a chance to save yourself, change to the droid and fall in. When you respawn, the droid will be driving the vehicle. If it's R2-D2 and you're in a car, he'll stick out his little arm and put it on the steering wheel. In 2-player mode, make one of the characters Darth Vader. Find a Stormtrooper next to a door somewhere. Whoever's Darth Vader, run up and start force choking the soldier. Before he dies, the other person has to run through the door. Go back into the room you were just in, and the Stormtrooper should be floating up in the air, unable to get back down. In Through the Jundland Wastes, be a skeleton and hop onto a Bantha. Hop off. The skeleton should be standing up perfectly straight and sliding instead of walking. This can happen to other characters, too, but it is unknown how it is caused or how to undo it. In Mos Eisley Spaceport, go where you have to blow up the metal gates with the box. Go up to where you have to pull the lever and get a box. Stand back from the box and shoot it a few times. It will start to glide across the ramp. When it gets to the end, it will float diagonally upwards and disappear. Go back to the lever and the box will be there, and will float straight upwards off the screen. On Chapter 2, Episode IV Through the Jundland Wastes, at the very last part of the level outside of Obi-Wan Kenobi's house, hop on a Dewback and run it off the cliff. Chances are, you can actually play as the giant alien lizard without a driver on it. In Jedi Destiny in 2-player mode, play as ghost Yoda and ghost Obi-Wan, and run around the area for about 25 minutes, but don't use the force or attack. Then the game will freeze. This only works on the PlayStation 2 version. In Jabba's Palace in free play mode, be Darth Vader and use the force on the floor so a pit is revealed. Get on the B'omarr and ride it down the pit a few times, chances are, you'll be the B'omarr. Then, toggle to any character and press the button that would normally make you hop off a vehicle, and instead of the B'omarr, that character will be walking around. Best Personal computer Action Game of 2006. "Best Game Based on a Movie or TV Show"
Kidzworld's Top Game of 2006. 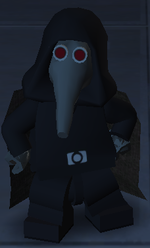 "Outstanding Game Based on a Previous Medium"
If you set the disguise to on, the figures in the cutscenes will wear the disguises. IG-88 and 4-LOM can activate astromech and protocol droid panels. Ewoks can grapple, even without a blaster. This page uses content from Wikipedia. 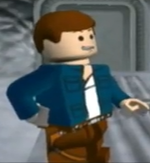 The original article was at LEGO Star Wars II: The Original Trilogy. The list of authors can be seen in the page history. As with Brickipedia, the text of Wikipedia is available under the Creative Commons Attribution-ShareAlike 3.0 license, however please help to make this a unique article to Brickipedia in any way you can. 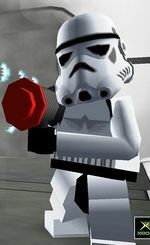 Facts about "LEGO Star Wars II: The Original Trilogy"
This page was last edited on 6 November 2018, at 02:16.